One of my cats has gone missing. PC came into my life nine years ago when his stray mama decided to raise him on my front porch. I lived in North Carolina at the time. He grew to be a beautiful and extremely loving cat. He loved to be held, and I loved holding him. 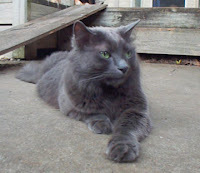 He's a beautiful gray (I like to say silver) long haired cat. Until recently he was an indoor-only cat, which is what I prefer, and how I believe all cats should be raised, for their own safety. But I installed a doggie door so that my dogs could go outside to relieve themselves while I was at work. Of course, this meant that the cats could go out, too. Most of them stay pretty close to home. But even though PC has been neutered, he would stray farther than the others. I live in a fairly rural area. My house is on a "dead end," so there isn't a lot of traffic. That's why I didn't worry too much about my cats being outside. I wanted to build an enclosure for them so they couldn't leave the yard, but I couldn't afford it. Now he's gone. He's been gone for 34 days. I dream about him coming home every night. I've put up signs, called the local vets, notified animal control. He has been microchipped, so he can be identified if he's found. He's not wearing a collar. Too dangerous for a cat. I know that I am completely responsible for whatever has happened to him. After all, if I hadn't let him out, he'd be home now. I hope he's not alone, scared, hungry, thirsty. Maybe someone has decided to adopt him and is taking good care of him. Eventually that kind person will take him to the vet, who will hopefully scan him and discover his microchip, whereupon he'll be returned to me. I hope so. I hope. I pray. Lots of free time. No money.